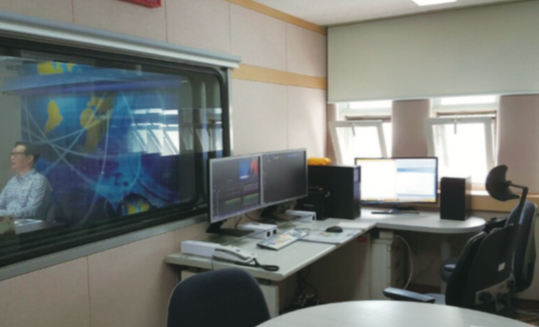 From January 22 to February 28, Hanyang University (HYU) Education Advancement Team has constructed a self-studio at a chamber on the fifth floor of Paiknam Library, where Damheon Library had formerly occupied. According to Cho Jin-ik, the Chief of the HYU Education Advancement Team, this newly built studio is different from other creative student spaces in the campus as it is entirely focused on producing videos. The studio is fully facilitated with professional video content-creating system, including an autocue prompter for live broadcasting, camcorders, lightings, and video production tools. “Video contents are taking a more dominant place in social media as production is getting easy and accessible to the general public. We hope HYU students actively utilize the studio as a useful tool to portray their creative ideas‚” said Cho Jin-ik. The self-studio is available to all HYU students by reservation from the beginning of the Spring semester. Specific instructions for the reservation and handling the tools are to be announced on the Paiknam Library website in early March.